Promising stallion foal son of Loki frá Selfossi and Evelyn frá Litla-Garði (8.19). Eva frá Heimahaga - 1. Júní 2015. Evelyn og Loki - ATH!! Staðgöngumóðir X2 - Móbrún - tvískipt fax betri toppur (aðeins meira en á hinni X40 - Hvítt í enni og hvítir flekkir á baki - leiðinlegra geðslag en í X40 - ekki örmerkt - Ekki rugla saman við X40 staðgöngumóðir Berglindar!! 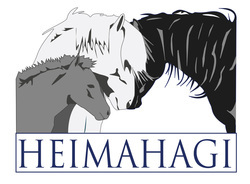 Eva frá Heimahaga is a promising mare, daughter of Loki frá Selfossi and Evelyn frá Litla-Garði (8.19). Kjerúlf frá Kollaleiru (8.44) has received 8.64 for Riding Abilities; 9 for tölt, 9.5 for trot, 8.5 for gallop, 9 for spirit and 9 for general impression, he has also 9 for slow tölt. Evelyn frá Litla-Garði (8.19) is a four gaited mare with 8.35 for Conformation and 8.08 for Riding Abilities; 9 for tölt, 9 for trot, 8 for gallop, 8.5 for spitit, 9 for general impression and 7.5 for walk. In B-Class (four gate) Everlyn has received 8.36 in preliminaries and 8.56 in finals. She's daughter of Hrymur frá Hofi (8.20; 9 for tölt, 9 for trot, 9 for gallop, 8.5 for spirit, and 9 for general impression. and Elva frá Árgerði (7.94) a four gated mare with first price for Confirmation 8.02). Hnikka's father, Kjerúlf fra Kollaleiru (8.44), is son of the four gated stallion Taktur frá Tjarnarlandi (8.37). Taktur (son of Orri frá Þúfu) has 8.51 for Riding Abilities; 9.5 for tölt, 9.5 for trot, 9 for gallop, 9 for spirit and 9 for general impression, and Fluga frá Kollaleiru (8.24), she had 8.73 for Riding Abilities; 9 for tölt, 8.5 for trot, 8.5 for pace, 8.5 for gallop, 9 for temperment, 8.5 for character and 8.5 for general impression. Evelyn's mother, Evelyn frá Litla-Garði (8.19), is daughter of Hrymur frá Hofi (8.20), Hrymur is a gour gaited stallion with 8.16 for Conformation and 8.23 for Riding Abilities; 9 for tölt, 9 for trot, 9 for gallop, 8.5 for spirit, 9 for general impression and 6.5 for walk, and Elva frá Árgerði, a four gaited mare with 7.94.